Above: images taken from the trial grounds. It’s difficult to emphasise just how essential the trial grounds are to our business, as it is here that our range begins and our quality is assured. Samples of new products from commercial seed companies are sent for trials each time a new flower or vegetable is offered. These new varieties come from all over the world and are grown on at our Devon site to be evaluated by our experts, led by Toby Connabeer. If they are judged as suitable and up to standard, they will appear in our flower seed and vegetable seed range in subsequent seasons. The trial grounds also acts as our quality ‘police’. A sample of every bag of seed delivered to us for packing is sent to be grown on to check for trueness to type and uniformity. 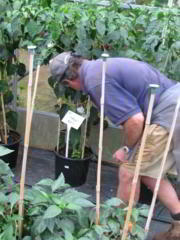 With over 200 years of experience in horticulture we believe that the highest quality is essential to our success and reputation and that makes the trial grounds one of the most important elements of the company. Find out more about our quality control process by seeing how the lab and quality control team prepare all of our products. 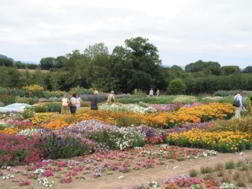 Since the 1830’s Suttons have had trial grounds to test vegetable and flower seed stocks. There were various sites used around the Reading area in the 19th century, including the Earley and Slough grounds that became well known landmarks. In 1976 when Suttons moved from Reading to Torquay trials were carried out at a nursery in Stoke Gabriel. In 1990 new grounds were opened at Ipplepen by the Duchess of York who performed the ritual tree planting ceremony. These grounds covered about 4.5 acres and worked well but in 2013 new grounds were found to accommodate the need for a larger area. Based on the outskirts of Paignton the new grounds cover 9.5 acres with much improved soil to that at the former site. The addition of a beautiful sea view and typical Devon rolling hills is an extra bonus! The increased acreage means that in addition to the all important trials we also have space to receive, hold, pack and despatch perennial plants, fruit and trees. Much of this work used to take place at our main warehouse but lack of outside space made this less than ideal. 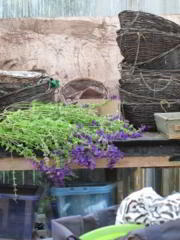 Above: images taken from the trial grounds open days. 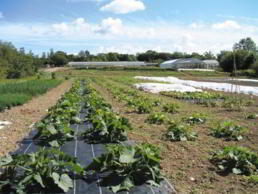 On our 9.5 acre site there is one enormous greenhouse, 2 poly tunnels, a Dutch barn used as a packing shed and an office. The trial grounds are about the plants and the outside space so naturally the smallest building is the office. On the day we visited vegetable rootstock trials were in progress with an exciting new rootstock being compared against the standard one that we have used for several years. 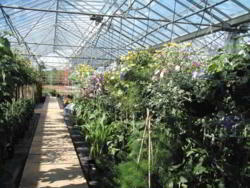 The huge greenhouse is divided into sections with one area heated and protected by curtains to keep the heat in. 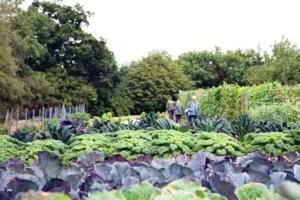 This area is perfect for propagating seedlings and small plants and also for winter trials of spring cabbages, onions and the like. 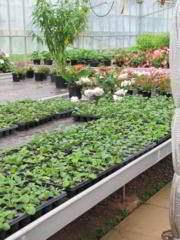 Huge tables floating on a roller system allow excellent use of space and thousands of seeds of hundreds of different varieties are sown in here every year to trial new varieties. At the time we were there rows of peppers and cucumbers were fruiting and enormous water melon plants were being grown vertically – almost reaching the roof! 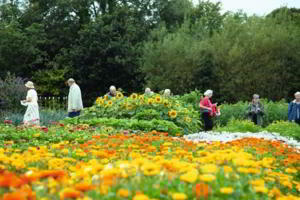 Outside a wide range of hardy annuals were giving a colourful display whilst rows of Sweet Peas, carrots, courgettes, French beans, squash, pumpkins and marrows were romping away. Hardy varieties are sown straight into the field for their trials as they would be in a normal garden. 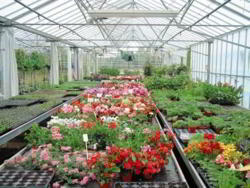 Others will begin their life in the greenhouse and, depending on how much molly-coddling they need, will be moved out at the appropriate time. There is a constant movement of plant material about the site. High fencing surrounding the site keeps out rabbits and deer who otherwise would have a feast. Pest control in the greenhouse is achieved by the release of indigenous predatory insects, including wasps, lacewing larvae and mites. This means that work can continue whilst the insects munch away, the alternative would be to clear the greenhouse for spraying. Led by Toby Connabeer, 6 members of staff help to keep the site in tip top condition, sowing thousands of seeds and transplanting a myriad of small plants from the greenhouse into the trial field. In addition, up to 30 people at peak periods are selecting customer orders and then carefully packing the plants ready for Royal Mail collection later in the day. Each year Suttons have a presence at most of the major garden shows and all of the plants for our stands are grown at the trial grounds. As only the best material can be shown, a lot of time is put in by Toby and his dedicated team to having the plants ready at just the right time – no easy matter! It takes a good deal of experience and good judgement to achieve perfection. Gold awards and silver gilts bear out that Toby and his team manage to get it just right! 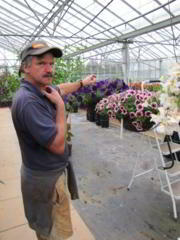 Above: Toby with his super hanging baskets. Toby has many years of experience under his belt and we asked him to give us a few of his best tips for you. 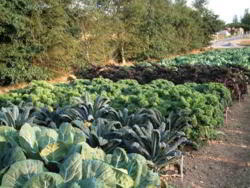 Manure or compost and dig over ground for spring use, in the autumn. 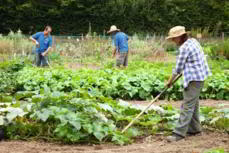 Avoid planting root crops in freshly manured ground. Cover seedlings with Vermiculite to hold moisture and aid the prevention of damping off. Use fleece to protect against carrot root fly on carrots and parsley, cabbage root fly on Brassica. 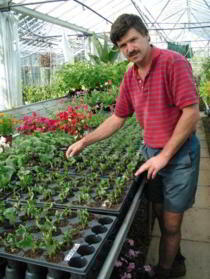 You can also use fleece to protect against late frosts when hardening off seedlings and young plants. You can use fleece to help when germinating direct sown veg, like dwarf French beans and Sweet corn etc. 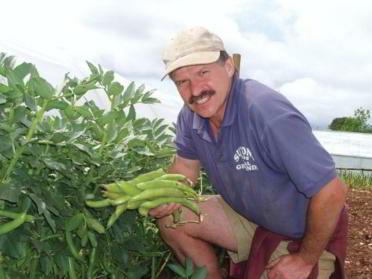 Use pest and disease resistant varieties where possible. Above: Toby doing what he does best!